Fees: $35.00 per rider in advance, $40.00 per rider at the door. Quiet back roads, beautiful rural scenery, and little elevation change make the Jim Kruse Century a fun and family friendly ride. The ride offers a 25, 50, 65, and continuous 100 mile option. All routes are mapped, marked, and well-sagged. Coffee and bagels will be available at Saturday’s ride start. Pre-registered riders are guaranteed a T-shirt, ride packet, and post-ride lunch. The Annual Jim Kruse Century supported ride offers a pleasant route on quiet back roads and past farmland scenery of rural Georgia. Whether you choose the 25, 50, 65, or the continuous 100, you will be riding a route with light traffic, little elevation change, and pleasing views of scenic farmland. Each route is mapped and well sagged for safety and convenience. In addition, there will also be a free Sunday ride that will not be sagged. Mass start for each day: Saturday Century 8 AM and Sunday fun ride at 9 AM . Saturday’s ride offers a 25, 50, 65 and a (continuous) 100 mile option. All routes are mapped, marked, and well-sagged. The Saturday Century is followed by a post ride meal. Sunday’s free ride is an informal 45 mile group ride that is not sagged. Helmets are required to participate in either ride. 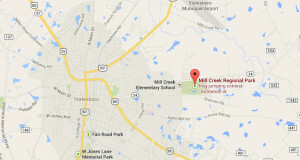 Both rides begin at Mill Creek Regional Park on Highway 24, just East of Statesboro, GA.To guarantee your T-shirt, please register no later than 12:00 PM March 30th. Late registrations and walk-ups may get a shirt, depending on if we have any left.